Korea is striving to develop versatile aquatic robots, which can swim as well as crawl on the seabed at a depth of 6 kilometers by 2016. The Ministry of Land, Transport and Maritime Affairs said Monday that the Seoul administration will channel 20 billion won over the next five years to create the underwater vehicles. "It must be able to swim at a speed of 18 meters per minute and walk 30 meters per minute to explore the seabed to search for organisms or minerals," the ministry's director Joo Hyun-jong said. 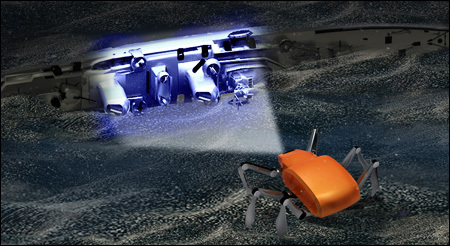 "On the strength of its precision camera and acoustic facilities, the robot will also be able to find sunken ships that divers cannot easily access to." The development of a six-paddle locomotive machine has drawn people's attention here since they could have helped following the sinking of the Navy frigate Cheonan in the West Sea late last month. Dozens of sailors died in the tragedy and eight are still missing. Bereaved families of the dead crew members believe that some of them might have been rescued alive had there been a faster search. Due to strong tidal currents and bad visibility in the West Sea, the search and rescue of the sunken vessel took several days. The ministry believes that such a six-legged drone would be ideal to work under such circumstances. "The development of walking deep-sea robots was proposed a couple of years ago before the Cheonan disaster as demonstrated by the modest 1 billion won earmarked for the project earlier this year," Joo said.